Life Fitness treadmills can be found in health clubs all over the world. It is one of the most popular brands in the commercial market today. But unlike other famous brands that overprice their products, most of Life Fitness' treadmills offer great value. If you’re a Life Fitness loyalist who can afford spending above $2,000 for a treadmill, then this review might be of interest to you. However, if you're someone who's a little price conscious, this brand definitely doesn’t fit you. I suggest you look for your best treadmill using our best buy treadmills page. Life Fitness is a division of Brunswick, a fortune 500 company founded in 1845 to make billiards tables. Through their excellent marketing over the years, Life Fitness has become the most used fitness brand in health clubs all over the world. The company started in 1968 through the invention of the Lifecycle exercise bike. And with the increase in popularity of health club chains in the 70’s, the company started gaining momentum. Today, Life Fitness employs more than 1,700 people at 12 international subsidiaries and manufacturing facilities, with 186 dealers and distributors in more than 120 countries. They also offer more than 300 different cardio and strength training products which includes Life Fitness treadmills for both home and commercial use. Other than a few $1,000 treadmills some years back, most Life Fitness treadmills for home are in the $2,000 and above price range. And with prices like these, I don’t think a lot of people can afford it. One of the biggest complaints of owners and experts a few years ago, is that most Life Fitness treadmills are overpriced. When this issue reached the company, they immediately did something about it. As a result, their treadmills today provide excellent value and some are even considered as best buy treadmills in its price range. To conclude, I would recommend Life Fitness treadmills, but only those that were manufactured in 2006 and beyond. (discontinued treadmills below are the ones made before 2006) However, if these treadmills are beyond your budget then I suggest you see our best buy treadmills section. There you will find treadmills we recommend according to price. If you want to buy a Life Fitness, I suggest you buy from Amazon. But before you buy, please read our reviews on individual Life Fitness treadmills below. It will help you better choose the fitness equipment that suits you best. 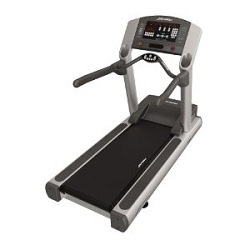 Others: This is the company’s most basic treadmill in the T-series. Others: This is similar to the Life Fitness T3-0 but bigger and more stable. Others: This is the company's premiere model in the T series. It comes with advance electronics. Others: This is the high end model in the T series. This was formerly one of our best buy treadmills above $4,000. Others: This is currently one of the best treadmills you will find above $4,000. Others: This is the most basic commercial treadmill from Life Fitness. Others: This is similar to the Life Fitness 90T but with better electronics and workout programs. Others: This is another basic commercial treadmill with excellent packaging. Others: This is probably the best looking Life Fitness treadmill in the market today. Others: This is similar to the Life Fitness 95Ti but with better electronics. Others: This is one of the most advanced commercial treadmill model from Life Fitness. Others: This is identical to the Life Fitness 97Ti but with better electronics. Below are some recently discontinued treadmill models from Life Fitness. I would keep these reviews here as most of these treadmills are still being sold online through auction sites or as refurbished treadmills. Others: This is the company's most affordable life fitness treadmill. Others: This is another value model from Life Fitness. Others: This is the most basic Life Fitness treadmill in the company’s premiere T-series. Others: This is probably the best Life Fitness model you can buy in the year 2006. Others: This is similar to the Life Fitness T3 above but with heart rate features and a more advanced electronics. Others: This is the company’s premiere model with basic features. Others: This is the Life Fitness’ premiere model with interactive heart rate features. Others: This machine comes with a huge running surface and a powerful motor. Others: This is a home version of Life Fitness’ commercial treadmills. Others: This Life Fitness treadmill is known for having the best display screen on a home treadmill. How are Life Fitness Machines For You? Are you a Life Fitness owner/user? We would really love to hear from you. It's fun, free and easy to do. We need contributors like you to help consumers in their decision. Click to view the full form and complete this submission. Once again, if you plan on buying this machine I suggest you buy from Amazon.